Furie used to have this diamond plated shredder. This was my 80's shredder, but I really never could shred so, yeah. My secret weapon is this Japanese Suzuki, that I bought in 1981, while I was stationed in Belgium (NATO HQ). 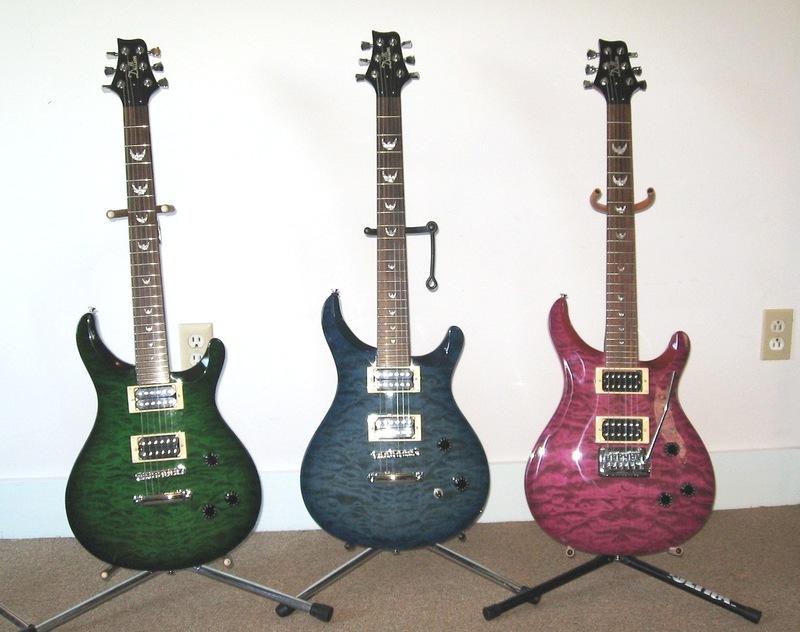 It looks innocent and innocuous, but they came with very high output Dimarzio pickups, that can absolutely scream. It demands the use volume control, to keep it reined in. I'll typically play it on volume 3 or 4, and roll in the dirt and squeals for lead parts. This is by far, my highest output hotrod. I was into Metal in the 80's but i was never really a shredder,i went to bass cause i didn't have the chops for guitar. Most of the stuff i was into the guys where playing Gibson's and Fenders anyway. I do have Flying V now though. Does this help re Gretsch content? Now that's what I call shred-tastic! Good looking guitar. Blends in nicely with the big boys. Plus 1 on what Parabar said in # 31. If I were to have gone down that road, it would have been with either my Epi SG Maestro or Corvette. Here’s mine. I got it in 1991 or 1992. ESP George Lynch Skulls and Snakes. I still have it, but haven’t played it much (in many years anyway). I still like it though...even though the Floyd Rose drives me nuts. I was thinking more of SuperStrat and shape guitars than more traditional designs. Actually my shreddiest may have been a Carvin DC50, a two-ton LP doublecut hewn of rock maple with their polepiece-overload sledgehammer pickups, in nunmor black. It was an acquisition of opportunity, not long desire. But I'd always been impressed by Carvin quality, so when it wandered in the music store in the mid-80s at an exceeding low cost of acquisition, I acquired it. BAM, that thing was a sonic weapon, and a fabulous control surface for a screaming amp. Clean it had no tone at all - but crunched up it pulverized. I kept it far longer than I should have, finally admitting to myself I had no real use for it. The most fun I had with it was tracking a studio song with the strings tuned down an octave. The same 10s I normally used on it. I know it sounds impossible, but with a very very light touch, you can tune and sorta play a guitar with strings that slack. It's an exercise in Zen focus, just barely making the strings move. But it was hilarious with the stupidly-high output pickups on the Carvin, because while I was barely feathering the strings, it sounded like tanks waltzing ponderously in formation. I mixed the part very low in the song, doubling the main riff guitar, and I love the tone. Wow! I think he just ate EVH's lunch on that one! 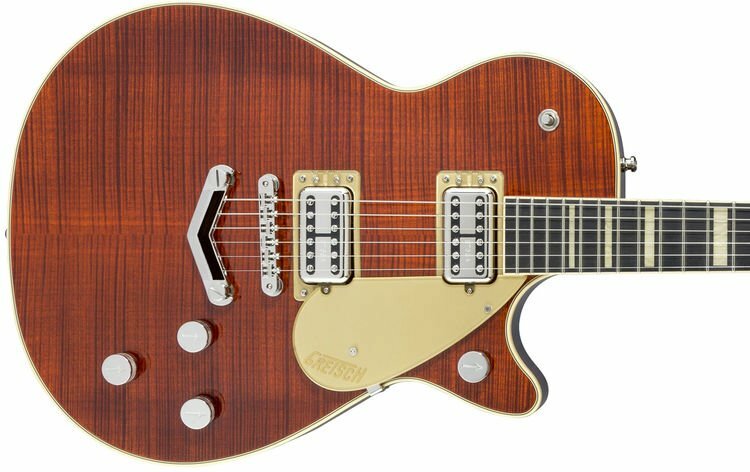 So much for Gretsch being just a cowboy or rockabilly guitar. Wow! I think he just ate EVH's lunch on that one! And the tone is so much better than many shredders I hear. Fuller-bodied. Mores taste, more filling! I'm about as far from a shredder as possible but I acquired this last to year to help out a friend. It is a surprisingly comfortable guitar to play. The chicken head knob is the pickup selector. This is not a shredder guitar but it is my only guitar with a traditional humbucker. It gets great punk or metal sounds. It's a Fender Blacktop Jazzmaster body with a custom 24.75" scale maple neck with a 12" radius. I wanted to create a Fender Les Paul. It came out exactly as I hoped. The humbucker sounds close to a Seymour Duncan JB, the neck Duncan Designed Jazzmaster pickup has the best funk and blues tone and the middle position could fool some people into thinking it's a Filtertron. I chose the Blacktop Jazzmaster because of these videos. Long gone, but it fits the bill. A 2001 Peavey EVH complete with a D-Tuna. And, someday, I would also like a Flying V.
Well I guess if you think you'd look good in that dress. 2000 Jackson USA SL-1. Long story behind this one. Way too much to type but I'll be more than happy to tell you about it if our paths ever cross. Wow! That’s just so obnoxious to me!